Garden City was ripe for the picking. 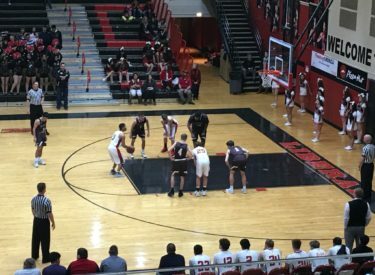 Playing without their point guard and coming off of a hard fought loss to WAC champ Hays, Garden City’s Buffaloes were sloppy Tuesday night. The Buffs committed 21 turnovers but still won 50-46 in the Big House Tuesday night on Liberal’s senior night. It’s Garden City’s sixth consecutive win in the Big House despite the fact that the Redskins won the past two WAC titles. The Buffaloes led 11-4 early and 13-11 after one quarter. Liberal led 25-19 at halftime before the Buffs took a 33-31 lead after three. Liberal made one of two free throws to trail 38-37 early in the fourth quarter before Garden City’s Jayden Crook made a three pointer to give Garden control the rest of the night. The Skins cut the lead to 47-45 in the closing seconds. Liberal took 41 shots to Garden’s 30. The Buffaloes buried 56 percent of their shots while Liberal shot 36 percent. Liberal was 4-15 from three point range and the Buffaloes were 6-13. GCHS won despite going 10-19 at the foul line. Cameron Riley scored eight of his team high 11 in the first half. Liberal is 8-11 and 1-6 in the WAC and Garden City is 12-8 and finishes 6-2 in the WAC. Hays clinched the outright WAC title Tuesday night with a home win over Dodge City. The Redskins play at Dodge City Thursday night at about 8 on 1270 and kscbnews.net.